Wave the flag, wave the flag, Stars and Stripes forever! This is the perfect American Red, White, and Blue Pinwheel Bow. There is a 1.5" white grosgrain ribbon on the bottom. The beautiful pinwheel consists of: navy and red ribbons with white polka dots, red with silver stripes, navy with red and white polka dots and the center theme bow of the stars and stripes. The center is wrapped with a white and red moon stitch 3/8" ribbon and it is attached to a French clip. 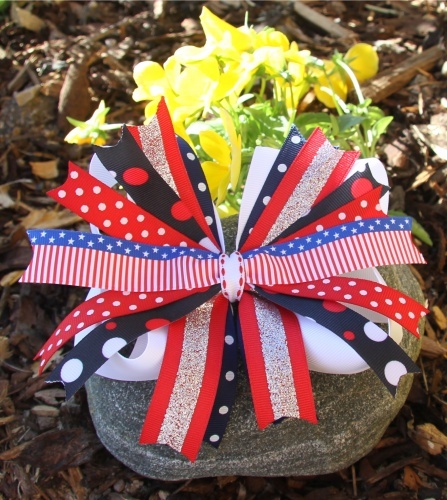 Be sure to get this bow for all our American Patriotic Holidays.